There is a new trend in decorating with tile. 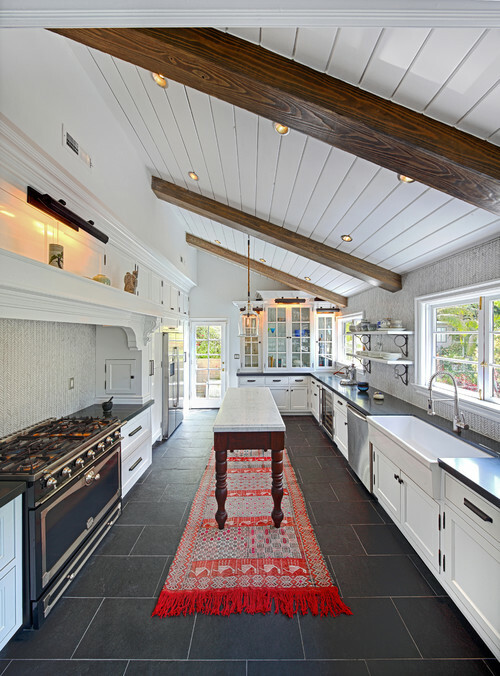 Using the color of black for tile can transform your home to new heights. Black tile is the craze of the moment. With different finishes, shapes and color tones, designing with tile in black is becoming a new classic in home remodeling and new construction projects. The look is sophisticated. Black colored tile gives your home a modern, up to date edge. Endless creative ways to use tile to enhance your home to the fullest extent will bring your home straight into sophistication. If you updating your home or building a home to resell that will attract buyers who seek something outside the norm- the look is timeless. The many variations of tones and textures are endless when using tile to decor your home. Black tile, in particular, will give any room a dramatic look of elegance. Consider black shiny subway tile with white grout for a standout back splash look in the kitchen. The white grout will help break up the black tile and make it stand out even more. Dark tile floors give a dramatic hue to kitchen flooring with white marble counter tops and white cabinets. Rich black porcelain glass tiles in your shower paired with chrome fixtures give any old bathroom an updated look. Dark tile floors give a dramatic hue to kitchen flooring with white marble counter tops and white cabinets. Rich black porcelain glass tiles in your shower paired with chrome fixtures give any old bathroom an updated look. Choosing a shiny tile over a flat matt tile for the bathroom stall will look exquisite under natural light bouncing off the walls. Do consider brass fixtures and not just chrome. The brass gives a warmer contrast. What Type of Tile is Best For Each Room? Tile floors will need extra care depending on the type of tile used. The beauty of them is certainly worth the extra care. If you are adding tile to your entrance way, consider slip resistant slate. It helps prevent slips and falls for those coming in from the rain and inclement weather. Using dark grout looks great with dark tile and just hides the look of dirt 100 percent. Stain resistant- glazed porcelain is easy to clean, less porous and more resistant to water. They come in a wide variety of styles for indoor and outdoor use. The pros always recommend a darker shade for grout, so black or gray hues are ideal as stains will not show as much, if at all. This tile is also more scratch resistant making it a great choice for high-traffic areas like the kitchen and dining areas, and the family room. Porcelain tile is also fire proof and can last for decades. Porcelain tiles color runs all the way through the tile, rather as they are called full-body tiles. When color is completely throughout the tile, they don’t show wear, making them a consideration for commercial applications. Small tiles known as hex tiles create an inviting look to a shower stall. To prevent showing of dirt use black grout with a matt black tile for a bathroom or kitchen floor. The black grout can make it even more dramatic. If you are placing the tile in a bathroom, small mosaic tile is an excellent option. They come in 12X12 lightweight sheets, which makes for an easy install. In the bathroom, where more water usually gets on the floor, it is one of the best choices as the grout lines are tighter and the floor has more traction. For shower stalls, the tiles that give a luxurious look consider glass tiles. While these tiles are more expensive, glass tiles are more water and mildew resistant because they are not as porous. You can also get more creative with the placement of the tile, creating endless color combinations and designs. The only disadvantage is the price, which is about $7.00 per square foot. It’s advised to hire an expert on the installation of glass mosaic tile. Repairs can also be costly, but if this fits your budget, it is a great choice to increase the beauty of your home. Oversized Travertine tile is best suited for large spaces such as a living room or dining room and gives a more dramatic effect to the room. They can also be used throughout the home and they look spectacular all throughout a ranch style home. If you live in a colder climate, talk to your installer about radiant floor heating. They are ideal for hotter climates as they give a cool touch to the foot. Tiles have ratings.When shopping for tile it is advisable to be familiar with the ratings so you can know what to expect from your purchase. PEI Class 1 Rating (No foot traffic) – Recommended for wall use only in residential and commercial applications. PEI Class 2 Rating (Light traffic) – Recommended for both wall use and bathroom floor applications. PEI Class 3 Rating (Light to moderate traffic) – Recommended for countertops, walls, and floors where normal foot traffic is expected. PEI Class 4 Rating (Moderate to heavy traffic) – Recommended for all residential applications as well as medium commercial and light institutional. PEI Class 5 Rating (Heavy to extra heavy traffic) – Recommended for all residential as well as heavy commercial and institutional applications. Black tile is not just for the modern home. 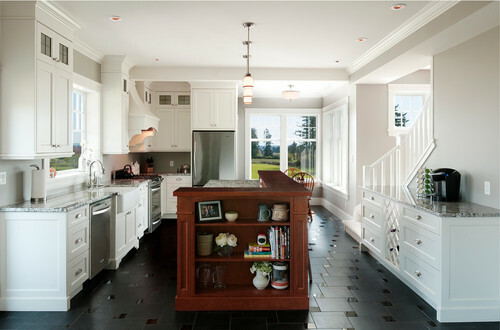 This photo is an exemplary example of placing a black tile in a remodeled farmhouse. Do you still want white in your bathroom, but need some depth? 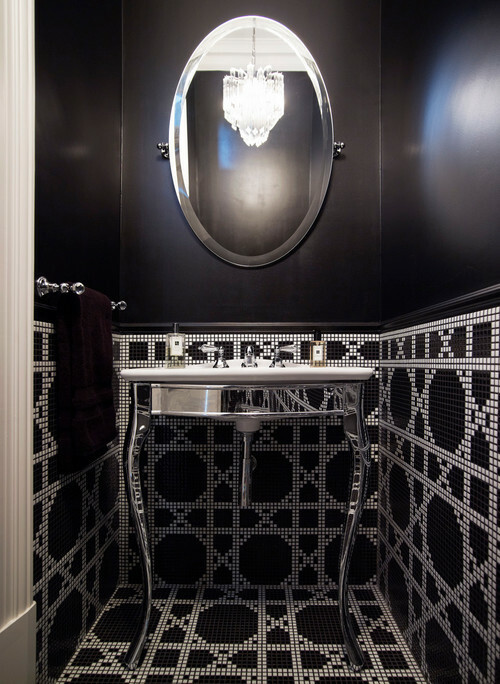 This is the perfect way to use black tile while still not forgoing your white and other colored accents. Mix and match tile colors when you don’t want to go all black. You will still obtain a standout look without giving up on white. Incorporate black tile in a private area as the shower, while still keeping white or other soft hues as the main color theme. It’s not just ultra modern homes that can carry the black tile look. Older homes in need of updating look fantastic with black slate tile. This is the new modern traditional, and it’s spectacular. The chrome contrast against the black floor gives a new look to the sophisticated traditional style. Would you consider using black tile for decorating your home? Please let us know what you did to incorporate the color into your home.